Monopoly is the classic family board game that sees players take turns in buying and selling properties, dabbling in property development through adding houses and hotels and collecting rent from their opponents. Hasbro has taken this popular board game and created a version that is perfect for preschoolers and beyond. It’s called Monopoly Junior. I have always loved playing board games, even as a child. I have clear memories of me asking my parents and sisters repeatedly to play with me, until Mum decided that we would start a new tradition of Friday night board game night. It was something the whole family really looked forward to, Monopoly being a favourite. Looking back, playing board games from an early age brought our family closer together and I learned many valuable life long skills at the same time. Board games are so great for encouraging children to be mentally active, challenge their thinking and learn as they play. I’m so thrilled that I now get to enjoy watching my own children engage in learning and play with Hasbo Monopoly Junior! It’s a wonderful game, designed for preschool children and beyond. It’s quick to set up, easy for little ones to understand and it’s fast paced, so they don’t get bored. 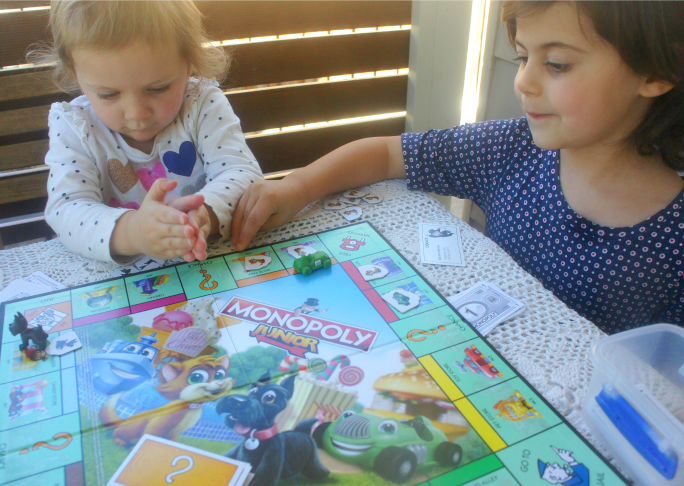 Our Monopoly Junior board game is a favourite in our home. It’s also a surprisingly versatile learning tool for kids. 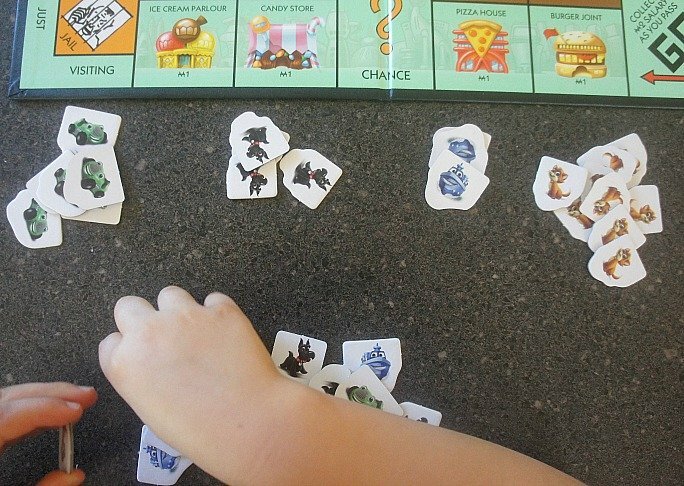 The play money, Chance cards and character tokens, which are all included in the game, can be used to create other games and play ideas that will excite a child and extend their learning skills. Hasbro’s Monopoly Junior certainly can be used in more ways than one. Let me share some simple play ideas with you. 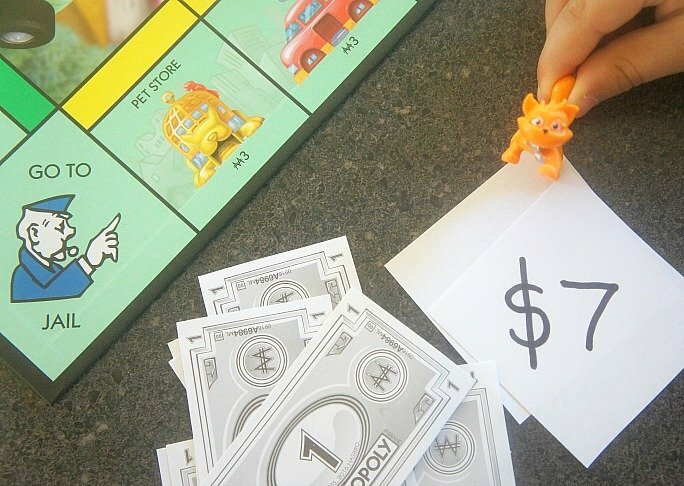 Monopoly Junior money is all in one dollar notes. These notes can easily be used without the actual board game and simply used to engage a child in games of buying and selling. This can help them gain a clearer understanding of how money can be used and build an appreciation for it. For fun, I created some simple price cards and pretended to sell one of the cheerful Monopoly characters. My 5 year old, Possum, used the Monopoly Junior money to count out the correct money required to buy the cat. We had fun reversing the role and I would purposefully over pay, which required Possum to solve a mathematical problem and give me back the correct change. Monopoly Junior has a set of fun and easy-to-read ‘Chance’ cards, similar to the version you’d be familiar with. Each card can have a positive or negative impact on a player’s progress of the game. We used these cards, with their short instructional sentences, as a tool to develop literacy skills. Possum would find letters, words or sentences that were familiar to her or that she could use good reading strategies to decode. It was also great to talk with her about the meaning behind what was written on each card as this helped her to develop her reading comprehension skills. The Chance cards were also useful in us playing a simple game of snap, as each of the cards had a familiar Monopoly character on it. Snap is always lots of fun and a great way to help children learn more about taking it in turns and following the rules of a game. 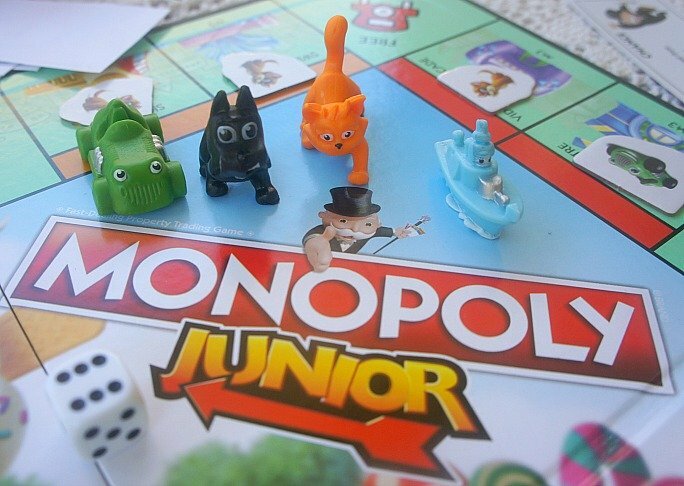 In the game of Monopoly Junior there are 48 character sold signs, which you place on whatever property you have purchased during the course of the game. There are 12 character sold signs for each player to use. These are also a wonderful tool for learning. At the conclusion of our game, Possum played with these character sold signs for a very long time. Firstly she wanted to group them according to the Monopoly character displayed on the front of each one. Then I challenged her to group them according to other rules, such as creating a pile of animals and non-animal characters. The rules for grouping the character sold signs went on and it was wonderful to see her get so excited with each new opportunity. The character sold signs were also a wonderful tool for creating a wide variety of sequential patterns too! We all love the original game of Monopoly, but I have to say that Monopoly Junior is the most popular family board game we own at home. It’s so well designed for those who are preschool age and beyond and you quickly see that your child is learning without even realising it. It’s also very easy to use the play money, character sold signs and Chance cards to extend a child’s learning beyond the game. 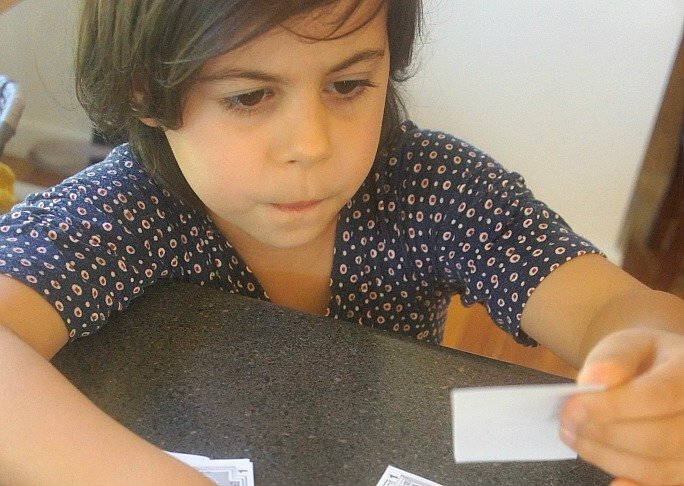 It’s a game that can certainly grow with your child and their learning capabilities. 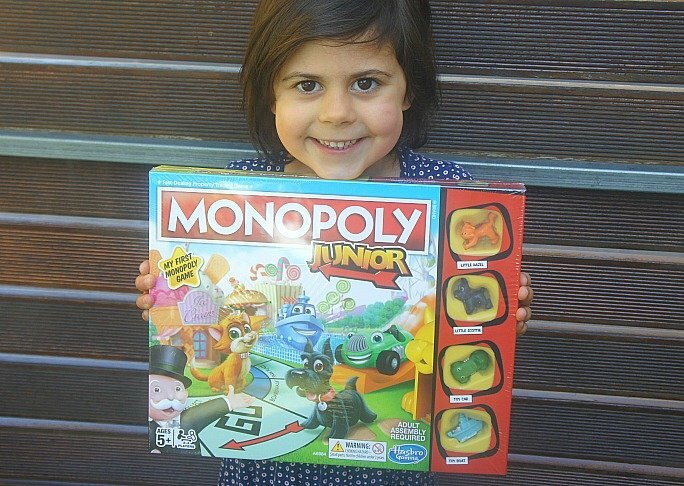 Would your child have fun and learn with Monopoly Junior? Kate Lloyd is a primary school teacher and mother of two young children. Her blog, Laughing Kids Learn, shares fun and educational activities that parents can do at home using simple and everyday materials. 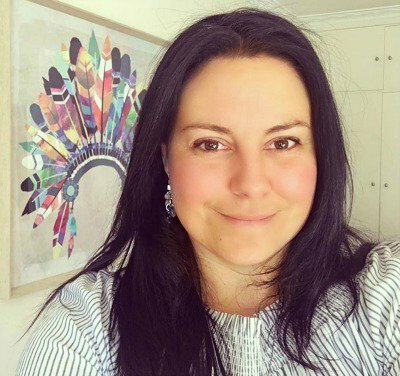 She also runs a successful Facebook group called ‘Activities for Kids’ that focuses on community and connecting with others who value children learning with play.